I have been deeply engrossed in how to create a life for quite awhile now. I’ve held a Soul Day and created an Intention Mandala on January 1st for several years. Does it work? Well, let’s see… I’ve “manufactured” a major UPI blog presence, Conari came out of nowhere to ask me to write a book, Writing Down Your Soul is approaching its third printing, the new matching journal, My Soul Page, will be out in May, people around the world have fallen in love with deep soul writing, I averted bankcruptcy last year by diving deeply into my Soul Day process, and that experience created my next book, The Lotus and The Lily. So, you’d think I know what I’m doing. You’d think my Soul Day process was complete. You’d think I could just show up on January 1st and go through my magical motions and VOILA 2011 would unfold as it should. It’s always new. It’s always a mystery. Something new somehow always lands in my lap and surprises me. Today it was a poem. By Hafiz. I love Hafiz. I know Hafiz. I keep Daniel Ladinsky’s books close at hand. So I guess I shouldn’t be all that surprised that the first thing I did on January 1st was ask Hafiz to step out of the 14th century and tell me what I need to know about the precious gift of 2011. I closed my eyes and opened The Gift and read a poem I’ve never read before, despite reading this book every day for 3 1/2 years. That was before the seed cracked open. and tickling each other while fixing the evening’s food. Thank you Hafiz, for my “theme song” for 2011. I printed out the poem, drew a cracked open seed in the corner, and posted it on my Intention Mandala for 2011. Every day for the next 365 days, Hafiz will remind me what my work is REALLY all about: Not me, but We. Not writing, but “love-mischief. What a sweet blessing. Thank you, Hafiz, for showing me in just a few lines what the new year is REALLY all about. Then open the book, let the words find you, and take them in. They are a gift. They are a blessing. They are an insight from your Self to yourself. I wrote this feature article for my Writing Down Your Soul newsletter on Dec 28. If you’d like to subscribe, click above. You haven’t heard from me since December 1. Going a month without communicating is a giant no-no in my profession, but I just couldn’t. I set first one and then another and still another deadline to get a newsletter out before Christmas and watched as each one slipped away. I asked about this problem as I was falling asleep on Dec 21 and in the drowsy first moments the next morning the words New and Renew popped into my head. It was no accident that this awareness came on Solstice. The earth, our mother and primary teacher, shows us year in and year out that life is a cycle of birth, growth, death, and in the silence that follows, renewal. And what comes out of this fallow silent period? Why new birth and new growth, of course. Mother earth has been demonstrating this for eons. day comes when we simply do not have the juice to keep going. So this December, I’ve been following mother earth’s advice. She’s in renewal mode and so am I. I’m quiet. If you could peak in my window, you’d see me in my favorite reading chair surrounded by books and blankets and tea. Or writing in my sacred writing chair. Or devouring Italian cookbooks and experimenting in the kitchen. And you’d see me sleeping. Oh, how you’d see me sleeping. Some mornings, you’d look at your watch and shake your head: Surely she should be up by now! To be honest I thought the same thing. But then I decided to let go of any judgment of what I should be doing and just be in the place of renewal. I sense this is a rich place. A lot is going on inside, whether I see it or not. And out of this quiet state will come a vibrant 2011 bursting with new ideas, books, and events. To ensure that happens, I’m going to cap my December renewal period with a “Soul Day” on January 1st. I know from years of experience that the best way to call in a magical new year is to step into abundant quiet for 24 hours on the first day of the year and in that quiet have long chats with Spirit about what is important in the next year. The end result is a short list of crystal-clear intentions. I’m talking about something more. Something bigger and deeper. I’m talking about articulating your relationship with Spirit. I’m talking about stepping into a commitment to live a life in partnership with the divine. I’m talking about being of service to the spark of creativity that is begging to come to be born. If this is a new concept, I have news for you: you have no idea just how delicious your life can be–no, will be–when you step away from the limited concept of resolutions and goals and step into the abundant possibilities of living the life you are here to live. 1. Start by giving yourself the gift of Renewal. Set aside a half or full day to set your intentions for 2011. 2. On the page, in deep soul writing, have a nice long chat with your beloved Voice about last year. Talk about what happened and ask for guidance to extract all the gifts, learnings, and blessings of 2010. You’ll be surprised. 3. Next, write about all the people you cannot forgive for all the rotten things they did to you. Guess what, you can’t call in a magical new year while lugging them around. Let them go. Spirit will help you do it. And don’t forget to release yourself. Trust me, the number one person who needs to be forgiven is YOU. 4. Now, start talking over what you want next year. What matters? What would help you live a life of joy and purpose? Make a list. And don’t forget to talk about what you are you going to do for Spirit in return. This is a two-way street, after all. 5. Now it’s time to do something with your wish list. For years I made a Prayer Sandwich (Writing Down Your Soul p 188-199). Now, I make an Intention Mandala. And add the name my year at the bottom. You and Spirit can work out how to capture what both of you are going to do in 2011. 6. There’s only one thing left to do: Celebrate! You have just engaged in the deepest dialogue of the year. And this dialogue is already working to attract all that you need to live the life you’re here to live. Be grateful. Be happy. Raise your glass in gratitude and joy. Does a Soul Day make a difference? Oh baby! Every single thing on my Intention Mandalas since 2006 has come to pass. In 2006, I asked for a marketing partner and had UPI five days later. I asked for a publisher and had a contract with Conari Press that November. And it’s not just me. I started teaching The Lotus and The Lily course this year and now have dozens of stories, many of which take my breath away. If you want more help attracting a delightful and holy new year, consider joining me and Margo Mastromarchi for 2011 Intentions with the Angels, learning how to write the most important prayer in your life–your Soul Vows, and learning how to Plug In to the creative force of the universe. How are YOU planning on calling in a year filled with all the blessings the universe has in store for you? This week in our December Plan has been fun, fun, fun. As of last night, December 27th, we have a list with 27 delightful expectations for 2010. If you haven’t created your wish list, it’s OK, you can begin today or tomorrow or any day you want. Just sit down and get clear, really clear, about what you want to see happen in 2010. Please note the use of the verb “see” in that sentence. It sounds simple, but it matters. It really matters. Instantly, I recognized what I’d done. I’d put my focus for the last few months on paying bills. I’d made endless lists of what was owed and when it was due and then I jockeyed funds to make sure I had money in the right account on the right day. The only thing I’d been “seeing” was bills. And while I was looking hard and long at all that outgo, fear crept in. And once inside, it grew, and spread, and gobbled up all the air. But since December 1st, I’ve added one delightful item every day to my wish list for 2010. Wait a sec. I’ve got to stop calling it a “wish list.” These are not wishes. These are expectations. These are miracles. These are requests. Dare I say, demands? These are descriptions of the good things flowing to me in the next twelve months so that I can do the work I’m here to do and live the life I’m here to live. These are the ways I fulfill my purpose, my calling, my destiny. These are not wishes or pie in the sky dreams, these are real. And my eyes are fixed upon them. My eyes are now fixed on the horizon of Jan 1 and over that horizon comes my ship. My ships. My many ships. Filled with the 31 divine gifts of the year. No more wishes for us. We are alchemists. And alchemists know how to use the power of this magical universe to create. Last week — forgiveness week in our December Plan — I suggested that we call this list our “Freedom List” because as our ships come in, we break more and more of the bonds of doubt, worry, fear, frustration, depression — whatever name you give to what you know is holding you back. When you do those three things, what do you see? What one image or picture or object or animal or, well, anything, comes to mind that somehow symbolizes your year? Mine is a chair. As I began my Freedom List, I realized that my expectations for 2010 fall into 4 categories: my work, the partners who help me get that work out into the world, my son, and my life partner. 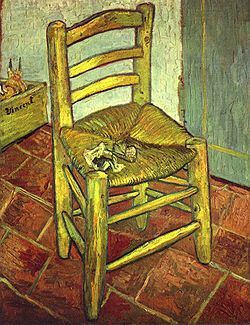 I know that when all four legs of the chair are in place, I will be living the joyful life of service I am here to live. And how perfect for me that the symbol of my divine year is also the symbol of the space where I work. I do, after all, spend my days sitting in my writing chair. So, I’m headed to the craft store to get a small wooden chair to put on my altar. And when I draw my mandala for next year (you’ll learn how to do that in the next few days) I’ll put my perfect four-legged balanced chair in the center. So your delightful task on this the 28th day of the December Plan to call in a magical new year, is to get a symbol for your year. If you’re not sure what that is, ask for divine guidance and it will come. On a walk, in a magazine, in your dreams, while deep soul writing…. It will come. Me? I see a gorgeous, strong, balanced chair with four gorgeous strong balanced legs: work, partners, son, husband. That’s some chair. My goodness, it’s more of a throne!